Today’s chicken roast recipe is a huge hit at my home as well as with friends. 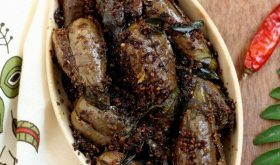 Makes for a wonderful starter or side dish with rotis. 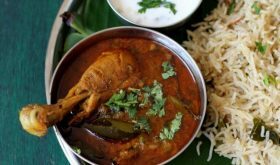 I found this recipe at Varsha’s blog which is home to authentic Kerala style non-vegetarian fare that I have bookmarked to try. The first recipe to try from her blog is Pepper Chicken Roast. I have already made it twice and will be a regular chicken dish at home. I more or less followed the recipe to the ‘T’ adjusting the quantities of spices used. Thank you, Varsha for sharing with us a wonderful lip-smackingly good chicken roast recipe. 1 Heat one and a half tbsps of oil in a heavy bottomed vessel, add cardamom, cloves, cinnamon stick and pepper corns and saute for a few secs. Add the curry leaves and saute till crisp. 2 Add the sliced onions and saute till transparent, approx 5-6 mts. Add ginger garlic paste and saute for 4 mts. Add turmeric pwd and pepper pwd and combine well. Add the chicken and cook on high for 4 mts. Reduce flame, add salt, place lid and simmer till chicken is almost cooked. 3 Heat half a tbsp of oil in another cooking vessel, add curry leaves, coriander seeds, fennel seeds, pepper corns, cardamom, cloves, cinnamon and nutmeg and saute for 3 mts on low flame. Next add the sliced shallots and saute for 2 mts. Add the grated coconut and saute on low flame for 4 mts. Turn off heat and cool. Grind to a paste without adding water. 4 Add this paste to the three fourth cooked chicken and combine well. Add few tbsps of water if the curry is too dry. Otherwise there is no need to add water. Place lid and cook for 5 mts. Now increase flame, and toss the contents for 2-3 mts. Lastly sprinkle some kasuri methi, combine well and turn off heat. 5 Serve hot with rotis or rice. Recipe looks good. I guess 1 kg chicken is the full chicken. Will it taste as well with 1 kg boneless. Or only chicken drum or chicken thighs. chicken is more tasty with the bones? Chicken with bones is best suited for this recipe, Sarita. Adjust spices according to quantity of chicken. How lovable & adorable the chicken looks!!!!! Very tempting!!!! A restaurant in my native served ‘Chicken liver Pepper fry’ which tasted awesome. Your recipe reminded me of that. Can I substitute chicken pieces with chicken liver pieces and churn out this dish? Please advise. Yes, you can. I haven’t tried it though. My mouth is watering so bad for this! Is there an alternate to Coconut or is coconut a must? You can omit coconut but it definitely enhances the flavor. Should I use dry coconut or fresh coconut?? Thank you for your recipes. Today i tried pepper chicken roast and chicken curry. It came out very good. If you have any recipes for raagi…please! Thanks again. Prepared Pepper Chicken Roast as a starter with drinks for Valentine’s day….. slightly modified though….. 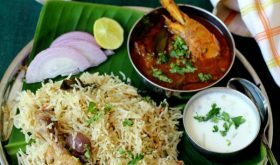 I had to add some chili powder for spice as my hubby does not prefer too much of pepper…….. turned out lovely though…….. he just loved it….. thanks for the wonderful receipe……..
Hi sAilu.. Wanted to know… should the fresh cocnut be roasted to brown or slight roasting will do? Roast to a golden brown shade, Anu. I’ve tried this recipe yesterday, it was awesome. I wasn’t sure when to add the green chillis so I added in the ground paste and it worked out fine. Thanks Sailu garu for this amazing recipe. http://varshaspaceblog.blogspot.com/2009/10/chicken-pepper-roast.html is the one you have made..:)..thanks again..! Excellent dish.. tried it yesterday; brilliant!! Cooked it today and it was quite nice. We had it with kulchas. I squeezed half a lime on it, and next time would like to put half of cup of water to make some masala to eat with roti. 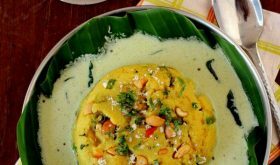 Hi– can we use dessicated coconut with this recipe? Thanks. 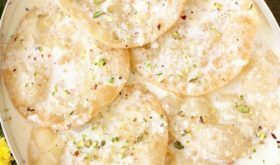 I have not tried dessicated coconut for this recipe. If you have used it, do let me know the results. Hi– sorry, another question. In the ingredients it talks about green chillies, but unless I’m mistaken I don’t think the green chillies appear in your directions. Incidently I’m in the middle of cooking this right now and am using dessicated coconut. Fingers crossed! You can add green chilies at the time of sauteing the onions and ginger garlic paste. I have not tried dried coconut powder. Do let me know the results. 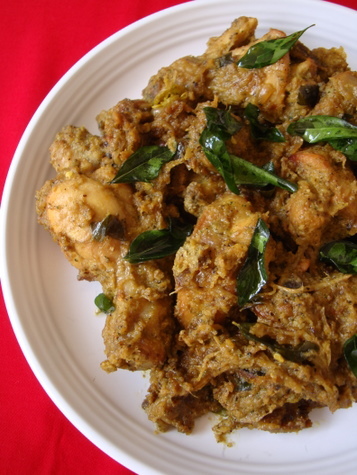 Hi– Just to let you know that the recipe turned out fine with dessicated coconut. I hadn’t gotten your response in time, and so my chicken was lacking green chillies. For my tastes they were lacking, but I cooked for farangs and so the toned-down spice level was perfect for them. You can omit nutmeg and follow the rest of the recipe. One of the best…we couldn’t stop eating it, even my 3 yr old loved it…thnx Sailu! I have tried your chicken on several occasions and every time it was a hit. Thank you so much for sharing such a delicious recipe. Looks and sounds delicious! Plan to make it for dinner. Had tried it that day and it turned out awesome. Making it again tonight. Thank you so much for sharing!